Donald Trump has been short and sweet in his response to the tragic shooting in Parkland Florida that saw 17 students and teachers gunned down by a right-wing white supremacist. First he repeated his long-held opinion that it isn’t yet time to discuss gun control. That opinion is probably much to do with the huge stream of funding coming to him and his supporters from the National Rifle Association (NRA). They are busy campaigning to arm and train teachers in gun use. They say more guns in schools would make schools safer. Trump supports the NRA as much as it supports him. He says the shootings are not a gun problem but a mental health problem. He ignores the fact that, in countries where guns are far more difficult to obtain, the mentally ill find it far more difficult to actually kill and injure people. This is the same kind of demented Trump logic that says anyone attacking civilians with guns or bombs who is black or Muslim is a terrorist whereas, if they are white, Christian and even a white supremacist, then they can’t be a terrorist, just mentally ill.
Our comparative figures for school shootings in Britain and the US are remarkably revealing. On one hand the history of school shootings in Britain is very short. On March 13 1996, the Dunblane massacre took place at Dunblane Primary School, near Stirling, Scotland. Thomas Hamilton killed 16 children and one teacher before committing suicide. The Dunblane shooting led to the banning of handguns in private possession in Britain. There have been no school killings and only one spree killing, in Hungerford on August 19 1987, since Dunblane. In contrast here is a list of shootings at elementary, middle and high schools in the US that have resulted in fatalities in the last 20 years. This list does not include suicides, gang-related incidents or deaths resulting from interpersonal conflicts. February 14, 2018 — Marjory Stoneman Douglas High School, Parkland, Florida. Expelled student white supremacist Nikolas Cruz kills 17 and injures 14 more with an AR-15 rifle. January 23 2018 — Marshall County High School, Benton, Kentucky. A 15-year-old student shoots two dead and injures 18 others. The suspect is arrested. December 7 2017 — Aztec High School, Aztec, New Mexico. William Atchison, a former student, shoots and kills Casey Marquez, Francisco Fernandez and himself. September 13 2017 — Freeman High School, Spokane, Washington. One student killed and three injured by a second-year student. April 10 2017 — North Park Elementary School, San Bernardino, California. Eight-year-old special needs student and his teacher killed by a teacher’s estranged husband. Two other students injured and the gunman kills himself. September 28 2016 — Townville Elementary School, Greenville, South Carolina. A 14-year-old opens fire in playground after shooting his father dead. One student dies, two pupils and one teacher are injured. October 24 2014 — Marysville-Pilchuck High School, Marysville, Washington. Freshman Jaylen Fryberg shoots five people in the school cafeteria, killing four. Fryberg shoots himself at the scene. June 10 2014 — Reynolds High School, Troutdale, Oregon. Jared Padget, 15, shoots Emilio Hoffman, 14, in the school gym. He later takes his own life. December 13 2013 — Arapahoe High School, Centennial, Colorado. Karl Pierson, 18, opens fire inside, critically injuring one student, who dies eight days later, then kills himself. October 21 2013 — Sparks Middle School, Sparks, Nevada. Twelve-year-old Jose Reyes takes his parent’s handgun to school and shoots three. Two students are injured one teacher killed. Reyes then kills himself. December 14 2012 — Sandy Hook Elementary School, Newtown, Connecticut. Adam Lanza guns down 20 children aged six to seven and six adult staff before turning the gun on himself. Police later find gun collector Nancy Lanza, Adam’s mother, dead from a gunshot wound. The final count is 28 dead, including the shooter. February 27 2012 — Chardon High School, Chardon, Ohio. Student Student TJ Lane, 17, kills six with others wounded when another opens fire in the school. Lane gets a life sentence but has already escaped once. January 5 2011 — Millard South High School, Omaha, Nebraska. Seventeen-year-old Robert Butler Jr opens fire on principal Curtis Case and vice-principal Vicki Kasper. Butler then kills himself. Kasper later dies. February 5 2010 — Discovery Middle School, Madison, Alabama. Fourteen-year-old Todd Brown dies after being shot in the head in a school hallway by fellow ninth-grader Hammad Memon. August 21 2008 — Central High School, Knoxville, Tennessee. Fifteen-year-old Jamar Siler shoots and kills 15-year-old Ryan McDonald. January 3 2007 — Henry Foss High School, Tacoma, Washington. Student Douglas Chanthabouly, 18, fatally shoots another student. October 2 2006 — Georgetown Amish School, Nickel Mines, Pennsylvania. Thirty-two-year-old Charles Roberts IV goes to a small Amish school and takes at least 11 girls hostage. Five girls were killed and six others wounded. Roberts then kills himself. September 29 2006 — Weston High School, Cazenovia, Wisconsin. Eric Hainstock, 15, shoots and kills the school principal. September 27 2006 — Platte Canyon High School, Bailey, Colorado. Fifty-four-year-old Duane Morrison takes six female students hostage. When Swat teams enter the school, Morrison shoots 16-year-old Emily Keyes. Morrison then kills himself. Keyes later dies at the hospital. November 8 2005 — Campbell County Comprehensive High School, Jacksboro, Tennessee. Fifteen-year-old Kenneth Bartley Jr opens fire on a principal and two assistant principals, killing one of them and critically wounding another. He is already out of jail. March 21 2005 — Red Lake High School, Red Lake, Minnesota. Sixteen-year-old Jeff Weise kills his grandfather and another adult, five students, a teacher and a security officer. He then kills himself. April 24, 2003 — Red Lion Area Junior High School, Red Lion, Pennsylvania. Fourteen-year-old James Sheets brings a revolver to school and kills his principal Eugene Segro and then himself. March 5 2001 — Santana High School, Santee, California. Fifteen-year-old Charles “Andy” Williams kills two classmates, a 14-year-old and a 17-year-old, and injures 13. May 26 2000 — Lake Worth Community Middle School, Lake Worth, Florida. Thirteen-year-old Nathaniel Brazill, after being sent home for misbehaving, returns to school and shoots and kills his teacher. February 29 2000 — Buell Elementary School, Mount Morris Township, Michigan. An unnamed six-year-old boy shoots and kills a six-year-old playmate, Kayla Rolland, at school. He is removed from his mother’s custody and put up for adoption. November 19 1999 — Deming Middle School, Deming, New Mexico. Twelve-year-old Victor Cordova shoots and kills a 13-year-old classmate. April 20, 1999 — Columbine High School, Littleton, Colorado. Eric Harris, 18, and Dylan Klebold, 17, kill 12 fellow students and one teacher before killing themselves. May 21 1998 — Thurston High School, Springfield, Oregon. After killing his parents the previous day, 15-year-old Kip Kinkel returns to Thurston High armed with a rifle. He kills two students in the school cafeteria, a 16 and a 17-year-old. April 24 1998 — James Parker Middle School, Edinboro, Pennsylvania. Fourteen-year-old Andrew Wurst shoots and kills science teacher John Gillette at a school dance. March 24 1998 — Westside Middle School, Jonesboro, Arkansas. Eleven-year-old Andrew Golden and 13-year-old Mitchell Johnson ambush fellow students and their teachers, killing five. Johnson is incarcerated in a youth facility. On August 11 2005 Golden is released after his 21st birthday, May 25 2007. 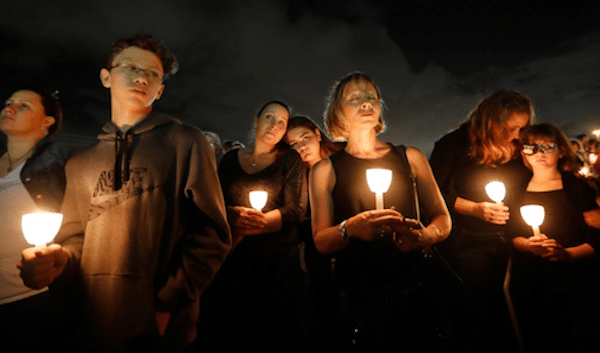 A candlelit vigil in memory of the 17 people killed in the mass shooting at Marjory Stoneman Douglas High School in Parkland, Florida.